Contributed by Michael Gray on February 25th, 2010 in Categories ColumnsWith content involving Tags Fire Emblem, Mars, Michael Gray, Oh the Humanity! Hello everyone, and welcome to “Oh, the Humanity!”, the column that reviews videogame-based movies (and sometimes books). Today, I’m going to talk about Fire Emblem, an anime series based off the first SNES Fire Emblem game. You probably haven’t heard of this series, because they only made two episodes. Both episodes were packaged together on a VHS tape in the U.S. in 1997. I have no idea why, because they didn’t release any Fire Emblem games in the U.S. until 2004. If you’ve played Fire Emblem: Shadow Dragon, you’ll kind of know what’s going on in the show, because Episode One focuses on the first chapter of that game. It features Prince Mars, whose homeland is suddenly invaded while his father is away. Forced to abandon his home and his twin sister, Mars flees with a handful of fighters to the nearby island of Talus, where he spends his time training to regain his homeland and flirting with the local princess, Sheeda. Eventually, however, Mars and his friends embark on the quest to find his father, fight the bad guys and save the world. Sheeda: Oh no! Enemies are attacking! Mars: We must fight them! Stretching that into a half-hour show is not an easy task, but the anime rises to the occasion. All the scenes in the show that weren’t in the game—flashbacks to Mars as a child, the death of Mars’ father, Mars spending time with Sheeda, etc.—serve to enrichen the plot and characters, unlike, say, Dragon Ball Z where 90% of the added material is time-wasting filler. The animation itself doesn’t have any problems, except for a few scenes where Mars’ hair magically changes color. I especially liked the voice acting, and I can’t think of any place where they could improve it. Gordin’s voice is hilarious. Just hearing him talk makes me want to laugh, and the comedic dialogue he says isn’t half-bad either. Sheeda also does a pretty good job as comedy relief when she goes into angry girlfriend mode. Voice acting highlights include Gordin at 4:40, and the evil villain at 3:18 (“Huh-ho!”). Oh, and I probably should have mentioned this earlier: the main character’s name is Mars, not Marth. 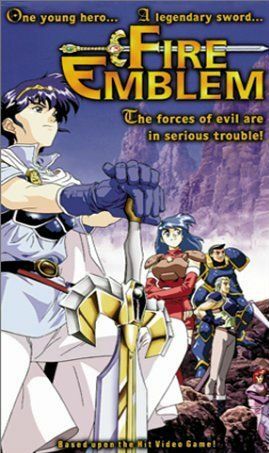 Years after this anime was made, the Super Smash Bros. Melee team decided the “official” English name for the character should be “Marth.” So…that means Mars and most of the other names that are used in this anime are now officially wrong. That kind of stinks. Mars seems like a much better name for the character, especially because of the whole Roman God of War connotation it comes with. All in all, I thought it was a pretty good show, although my favorite anime of all time is still going to be Save Me! Lollipop, which I have yet to actually see. I liked the first Fire Emblem episode better, I enjoyed both of them, and I think it’s too bad that they didn’t make any more episodes. Make sure to check out both episodes on YouTube if you’re interested. It’ll help tide you over until the next Fire Emblem game, which is coming in…um…there’s another Fire Emblem game coming out, right? Please tell me there is. I’m pretty sure that’s Conan O’Brien doing Gordin’s voice. Good to see he’s still getting work.